The team at Kite Zone Dubai lives to chase the wind and search for the most idyllic kitesurfing conditions on the planet. We organise annual kite camps to Kalpitiya, Sri Lanka, quite simply, so that you don't have to. This is the best way to experience the local culture, embrace nature, and radically boost your kitesurfing level in near perfect conditions. Welcome to the adventure of a lifetime! Looking for consistent winds & flat calm waters but unsure where to find them? Wish someone else could organise the luxury accommodation, airport shuttle service and food & drinks for you? Want tailored one-on-one kitesurfing tuition, video footage of your sessions, a boat rescue service and world class equipment to rent? We will be running four kite clinics in partnership with the Kodev resort in Kalpitiya, Sri Lanka. The dates for these are very felxible and run between the two windy seasons that Sri Lanka has. We will be running the clinics between June - September & also from December - March. This depends on the numbers we get for each trip. Please simply contact us for further details. Maximum of 6 people per trip (2 people per tent). Normally couples as each accommodation has one king size bed. The price of the trip per person is 1,490 USD + 200 USD for full equipment rental. · Minimum of 6hrs private tuition with GoPro footage! · Video playback and professional feedback from your instructor at the end of every day. This excludes flight tickets which must be bought at the individuals own discretion. Sri Lankan Fishermen catching their lunch! Kite Zone Dubai & Kodev have teamed up to bring you the kitesurfing adventure of a lifetime! Improve your riding level quicker than ever before and relax in wild Ceylon luxury as we head to the flat water, windy paradise of Sri Lanka for this epic experience. We all know Dubai can get a little stuffy during the summer months and that’s we why have made your endless search to find consistent winds and cool, flat calm waters a little easier. This is an all-inclusive kitesurfing trip designed simply to make a better kitesurfer out of you, and to help you have heaps of fun along the way. Meet a few new friendly faces, travel to a close-by but otherworldly kitesurfing haven, and make memories both on and off the water. Sri Lanka boasts some of the most peaceful & idyllic conditions for kitesurfing that we have ever seen, and we want to share this windy land of milk and honey with you. The summer months of July & August bring strong and reliable winds to Kalpitiya, located on the mid-western side of the island. This makes Kodev’s luxurious accommodation, but a stone’s throw away from the kitesurfing lagoon, the perfect place to set up camp. 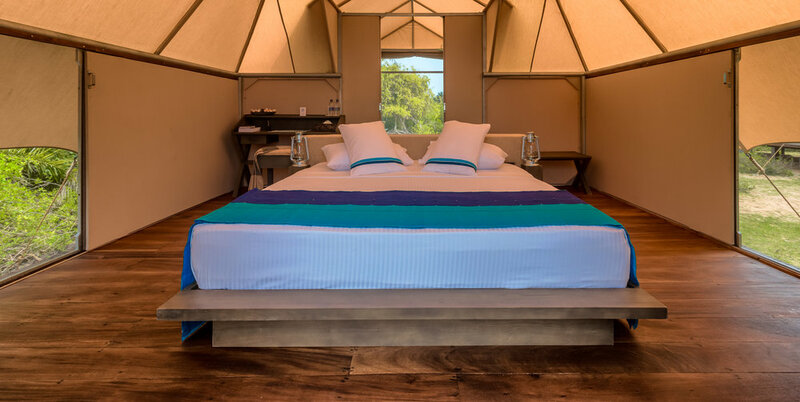 You will have your very own Ceylon lodge where you and your partner can enjoy some privacy amidst the natural surroundings. You will be taken by boat to our very own spot on the lagoon every morning after the riders briefing at breakfast, whilst Kodev’s fantastic staff make you whatever your heart (or stomach) desires upon arrival for lunch! After a full day on the water you can enjoy the finest locally sourced seafood this region has to offer, a most welcome meal after all that riding. At the end of the day you will be greeted back at the lodge with a cold beer and a hot towel to wash the salt from your face. Leave your gear on the boat for the staff to clean and pack away, and go enjoy a hot shower and perhaps another cold beer! This is truly where kitesurfing meets 5 star Hotelier service. Our aim is that after this 6-day intensive kitesurfing experience with Kite Zone Dubai’s internationally accredited and experienced instructors you will be able to ride confidently, competently, & safely back to the point on the beach where you began. Once you have mastered riding upwind, then we can progress onto jumps, tricks and turns! This requires a serious level of continued support, guidance, expertise, and motivation from your instructor, and that is what we will be there to provide. By providing GoPro footage, video recordings and personal feedback on how to boost your riding to the next level, we will make sure you reach the goals you have set for yourself at the beginning of the trip and help you to surpass even your own expectations! Unless you would prefer to bring your own, ALL kitesurfing gear can be supplied by Kite Zone Dubai (including kites, boards, harnesses, safety leash, & impact vests). By the end of the course you will be an independent kitesurfer, ready to buy your own gear (if you don’t own any already) and head out on the water by yourself. Kitesurfing Trip in Sri Lanka with Kite Zone Dubai - Progression at its peak!